When Hubbard created Dianetics, he acquired a devoted following. His possession of money and power removed many of the normal social restraints on his behaviour. When he moved on to Scientology, his need for control and vengeful nature were freely expressed in Church doctrine (notably the ‘fair game’ policy). Since the rules and practices of the Church of Scientology are based on these doctrines, the ‘behaviour’ of the organisation itself reproduces Hubbard’s malignant narcissism. Lane and Kent illustrate this thesis by examining the extraordinary persecution of Journalist Paulette Cooper, author of the early critical book “The Scandal of Scientology” (1971). Lane and Kent also describe other instances of Hubbard exploiting his position of ‘authority’ in the Church, to give full rein to the ‘spoiling behaviour’ that is characteristic of narcissistic personality disorder, by persecuting perceived rival for attention. After Hubbard’s death, the organisation seems to have assumed a life of its own. Unfortunately, it retains Hubbard’s malignant personality, and continues to persecute its critics and defectors with a ferocity that seems, at the very least, calculated to do them serious psychological harm. For example, the intrusive surveillance that defector Mark “Marty” Rathburn and his wife have been subjected to (which can be seen in the documentary film “Scientologists at War“) which is the subject of ongoing legal action. Under Hubbard, Scientology’s abusive behaviour was a direct of his orders and policies. Today, the organisation reproduces that behaviour in its members because it still considers those orders and policies to be holy writ, to be followed and applied without question. The dead hand of Hubbard is still directing the persecution of the enemies of his brainchild. Very sad indeed of this narcissistic personality disorder. David Miscavige has the same behavior I believe as I picked up on it watching the interview he did on 20/20. I know this because my own father is a full-blown narcissist sociopath. However I wonder about Miscavige. Hubbard created Scientology in his own image, personality disorder and all. Miscavige grew up in the malignant closed society that Hubbard had created and ruled over. Consequently, it’s difficult to decide if Miscavige also suffered from a pre-existing serious personality disorder if it was somehow induced by his early experience or a bit of both. Miscavige grew up serving Hubbard when the man was at his most arbitrary, capricious and cruel. Living your formative years in such a strange and extreme environment must surely distort your personality. Since he seized power he seems to have tried to reproduce Hubbard’s behaviour during the period when the man was going to pieces both mentally and physically in the belief that this is the optimum way to treat people and run an organisation. Miscavige is undoubtedly a distorted person who could never function in the wider world. I wonder how much of this he brought this to Scientology and how much Hubbard’s creation made him what he is. I tend to believe that Miscavige is merely a sociopath whose narcissism is only a product of his power. I am basing that on Miscavige’s sadistic streak. Perhaps, LRH beat Scientologists but, I have never read or heard any stories of such beatings. 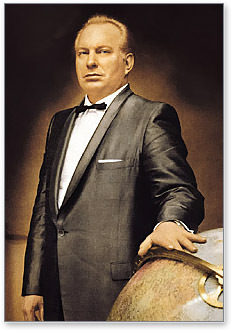 The central argument of the piece is that Scientology’s cruelty and disregard for its members is a consequence of the fact that it was created in the image of L Ron Hubbard. It continues to behave as he would have done – with casual cruelty and the uninhibited persecution of anyone who even questions it. I don’t see how Miscavige comes into the, but now you bring him up, I would say that he possessed the same personality traits as his guru.He didn’t come into power out of a clear blue sky. He obsessively worked his way up through Scientology and positioned himself to effect a palace coup because he wanted Hubbard’s position of absolute power so that he could freely exercise his own similar personality disorder. The position of ‘leader’ of Scientology fits him like a glove because of the opportunities for uninhibited narcissistic rage it provides. It fits him like a glove because it was constructed to indulge malignant narcissists. Hubbards’ cruelty may not have been hands-on, but it is reliably documented. For example, when he was at sea there are accounts of his making a man push a peanut around the deck with his nose, until his face was a bloody mess. Children were confined to a dark, dank and dangerous chain locker. His invention of ‘overboarding’. The fact that sometimes people were sometimes ‘reformed’ in this way with their hands tied. That alone seems to indicate a sadistic streak to me. There is, of course, also the behaviour of the Guardians’ office and the OSA – for example their efforts to frame Paulette Cooper and drive her to suicide for writing a critical book about Scientology – on the direct orders of L Ron Hubbard. that is, perhaps the best example of the man exhibiting narcissistic rage. Hubbard was too cowardly to directly attack someone – he always had the persecution done for him, and it was his intermediaries who have taken the blame had, for example, someone drowned during an overboarding. The soulless zombie of L. Ron Hubbard haunts Earth in its current form as the so-called “church” of scientology. I think of it as ‘the dead hand of L Ron Hubbard’, but yes, pretty much. The doctrines, practices and culture of the organisation reproduce his personality and act very much as he would have done, where he still alive.